Dr. Tom Smith is a full-time clinical athletic trainer at Mayo Clinic Sports Medicine in Minneapolis. The physicians he assists in the clinic specialize in sports medicine and regenerative medicine techniques including platelet rich plasma, bone marrow aspirate, F.A.S.T. procedures, and ultrasound-guided injections. He also works game days for the Minnesota Vikings as their visiting team sideline liaison. 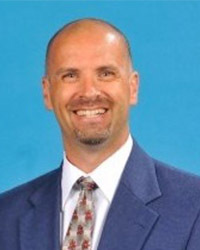 Smith has spent more than 20 years working in professional sports. He was the head athletic trainer for the Orlando Magic, assistant athletic trainer for the Atlanta Hawks, and he did his graduate athletic training with the Minnesota Timberwolves. He spent two years as the head athletic trainer for the Minnesota United soccer team. He earned his Doctor of Health Science from A.T. Still University, where he researched jaw joint concussion. He earned his master’s in Sports Medicine from the United States Sports Academy. His master’s research was on upper and lower body plyometric training. He did his undergraduate work at the University of Northwestern where he received a Bachelor of Science in Sports Studies. Smith shares his experience and expertise with students working on independent study and comprehensive projects, as well as in the Evidence-Based Injury Prevention course.